What’s the best thing to talk about when the market is firing on all cylinders? Recessions, of course. Rather than getting caught up in the excitement of Nasdaq 8,000, which we reached today, or the fact that the S&P has finally broken out to new highs, let’s ignore the crowd and stay focused. We have work to do. Today we’re going to drill down into the yield curve once again because while this incredibly accurate recession predictor has been around for decades, its popularity and overall presence in the minds of investors seem to have increased recently. In fact, it’s difficult to listen to any financial media station for more than an hour without someone blabbing about the flattening of the yield curve and suggesting it portends grave consequences ahead. Should we be concerned that the spread in the yield curve has fallen to below 100 basis points? Let’s find out. The first thing to point out is that there are many different ways to measure the slope of the yield curve. For whatever reason, the most popular measure quoted recently across financial media sources has become “10’s minus 2’s,” or the yield on the 10-year Treasury minus the yield on the 2-year Treasury. But a lot of academic research has been done on this topic, and they’ve looked at spreads such as the 10-year minus the 1-year, the 10-year minus the 3-month, and even the six-quarter forward rate minus the 3-month. In addition, researchers have also tried to incorporate a term premium component, an r-star component, and even an asset valuation component. Of all of these, which term spread is the most accurate predictor of recessions? And at what point during the flattening and inverting process should we begin to reposition our portfolios to safety? Let’s begin with a long-term chart of “10’s minus 1’s” or the slope of the yield curve as measured by the yield on the 10-year Treasury minus the yield on the 1-year Treasury. As you can see below, this indicator has fallen below zero in advance of each of the last nine recessions. During this period, there was only one false positive where an inversion of the yield curve was not followed by a recession. That episode was, however, followed by an economic slowdown, so whether you want to call this a true false positive is up to you. The takeaway here is that by itself, this measure (10’s minus 1’s) is an incredibly good predictor of an approaching recession. 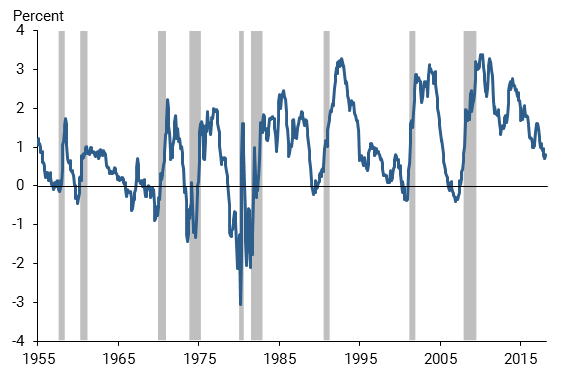 The delay between this term spread turning negative and the beginning of a recession has ranged between 6 and 24 months. In all cases, it has provided ADVANCE warning. Would you argue with an indicator that has been right 9 out of 9 times where in one instance it made a mild mistake? I wouldn’t either … but let’s see if we can do better. Michael Bauer and Thomas Mertens, two researchers with the Federal Reserve Bank of San Francisco, recently did some further analysis to see if different versions of the yield curve spread produced better results. In the chart below, they show how three specific yield curve measures performed prior to the last two recessions. 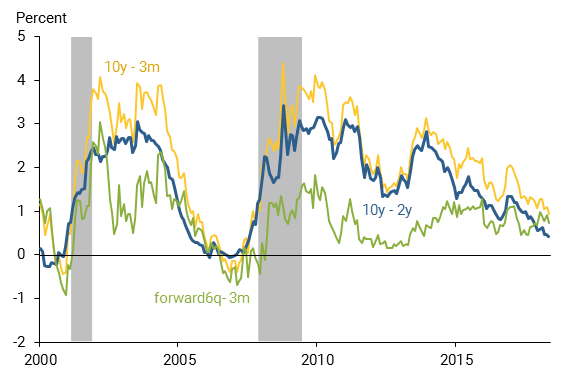 In blue we have the oft-quoted “10’s minus 2’s”, the yellow line shows the 10-year minus 3-month spread, and the green line shows a much shorter term spread – the forward 6 quarter rate minus the 3-month. As you can see, each of these successfully predicted both of the last two recessions. So does it really matter which spread we look at? The two researchers then attempted to understand the historical accuracy of these spreads by using them to predict (based on the level of the spread) whether the economy was in recession 12 months later. To assess this accuracy, they used an area under the curve (AUC) approach that originated in medical testing. With this measure, 0.5 implies an absence of predictive power, while 1.0 represents perfect prediction. The results of this analysis are included in the table below for the five most commonly used spreads. There are a couple of big takeaways here. The first is that ALL measures of the slope of the yield curve contain immense predictive power, accurately predicating whether or not the economy is in recession one year later 85-89% of the time. This speaks to the robustness of the slope of the yield curve as a prediction tool. 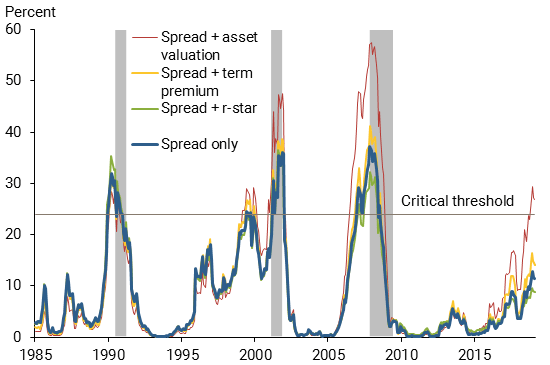 Now that we’ve determined which spread is optimal by itself, it bears asking whether the predictive power of that spread can be improved by including either a measure of the natural rate of interest (r-star), a measure of the term premium, or a measure of asset valuations. I’ll save you a long drawn out explanation. Based on analysis done by the same two researchers mentioned above, the answer is no. There is zero benefit to be gained by including these measures. But there is one last critical piece of information that is worth pointing out. I mentioned anecdotally in recent articles that we need not worry much about a flattening of the yield curve, as it is really the INVERSION of the yield curve that is cause for concern. Using a probit-model, which is a type of regression analysis where the dependent variable can only take two values (i.e. recession, no recession), Bauer and Mertens found that a term spread of zero (a completely flat yield curve) resulted in a 24% probability that the economy would be in recession 12 months later. That’s rather low … even with a completely flat yield curve, there is an overwhelming probability (~75%) that the economy will NOT be in recession 12 months later. By the way, if you’re wondering why these various studies use 12 months as the advance warning window, it’s because prior studies (Berge and Jorda 2011) demonstrate that this is the time horizon with the highest forecast accuracy. Alright, let’s now take a moment to recap what we’ve learned. The yield curve is a phenomenal predictor of an approaching recession. An inversion of the yield curve implies a very high likelihood (85-89%) that the economy will be in recession one year later. The measure you should pay MOST attention to, is the slope of the yield curve as measured by the 10-year minus 3-month Treasury. A flat yield curve is not necessarily something to be concerned about – but a negative term spread is very worrisome. 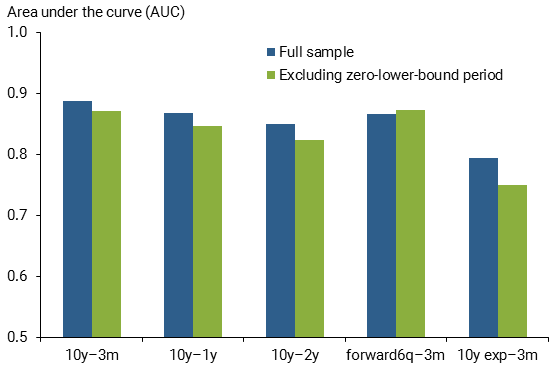 Based on these factors I believe it’s fair to say that the current yield curve spread (as measured by the 10-year minus 3-month) of 71 basis points suggests a very low likelihood of recession within the next year. That said, I’ll leave you with two interesting things to think about… First, the stock market typically tops out about 6-12 months in advance of an approaching recession. So in terms of equity allocations, there is less time to maneuver than you may initially think. At the point where the yield curve turns negative, stocks could be approaching their cyclical peak. Second, if the yield on the 10-year note were to remain at current levels, then we could see an inversion of the yield curve after just three more quarter-point rate hikes … Time to be careful, Mr. Powell.